Right after we finished our DIY project, the pink coat, this beauty came back in stock on Asos.com- and I couldn't resist. Wonderful color combination! Your mod dress is so chic. OMG this coat is gorg! Wish it would get cold enough here in Australia so I could wear this! great coat, big like from me! that’s an epic shade of bubblegum pink. Truly amazing! Love the pairing with the graphic elements of the dress and the smart colorblocking effect. What a fantastic look! I have the same coat, just posted a look wearing it last Saturday (http://www.tanyetlamode.blogspot.pt/2013/12/cotton-candy-algodao-doce.html). Love your blog; your outfits always inspire me! Congratulations and keep up the excellent work! HUgs from Aveiro, Portugal! LOOOOOOOOOve this outfit V! The coat , the dress and those boots..gorgeous together and separate! It’s definitely one of the nicest oversized coats in Pink, I ‘ve been eyeing it for a while but now know for sure that it needs to find it’s way into my closet for next winter, coming up in a couple of months! With summer in Cape Town it’s hard to imagine coats, but this is one little number that one shouldn’t miss! You look stunning! Me encanta el abrigo, es fantástico!! I WANT ALL YOUR COATS!!!! Adore this look! I have been looking for a jacket like that everywhere! It is divine! Hope all is well! Pink is stunning on you. I love the mix of colour, print and textures. Great look. The pink and yellow are GORGEOUS together! My dearest blogger you are pulling the PINK COAT TREND so well!!! As I said before you have the BEST COAT collection of all the bloggers I know. This is an amazing look. 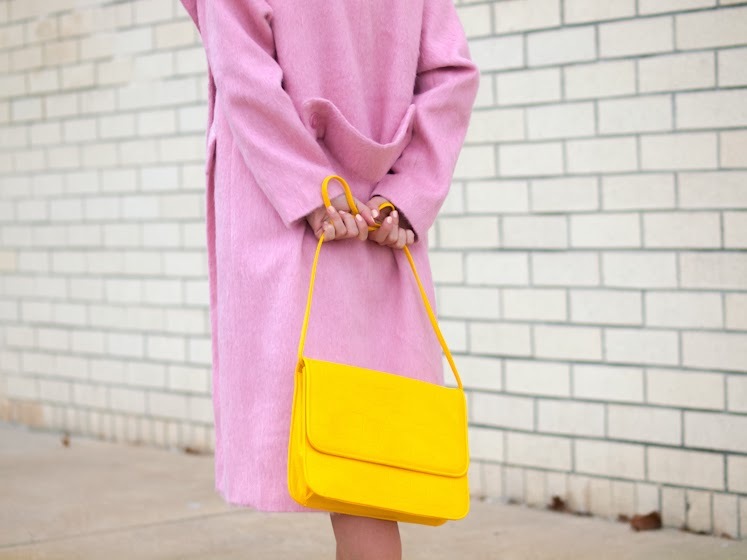 The soft pink paired with the dark blue and then an unexpected touch of yellow looks pretty fabulous.